The new Egyptian Parliament recently issued a statement undermining the 1979 peace agreement by proclaiming it was Israel’s bitter enemy. On March 12, 2012, Dr. Mohamed Al-Saed Idris, Chairman of the Arab Affairs Committee in the Parliament, presented the committee’s official outline of Egypt’s regional policy, as approved by a parliamentary majority that included the Muslim Brotherhood, the Salafi party, and the Egyptian Left parties. Idris is one of the founders of the Kefaya protest movement and a member of the leftist al-Karama party, which has formed an alliance with the Muslim Brotherhood’s Freedom and Justice Party. The statement of the Arab Affairs Committee is important in its wording and content. The term “the State of Israel” is not mentioned and is replaced throughout by the terms “Zionist entity” and “the enemy.” The statement focused on recent tensions between Israel and Gaza (Israeli attacks against Palestinian terrorist organizations and the launching of hundreds of rockets into Israel). It celebrates Palestinian terrorism, which is called “resistance,” and denies the very existence of Israel, which it defines as “an imperialist settlement entity” which is of “an aggressive nature” and which “drove a nation from its land by force to establish a racist state.” The U.S. is also blamed by the Egyptian parliament for its unconditional support of Israel. The Arab Affairs Committee’s statement was unanimously accepted and applauded in Parliament and reflects the true perception of the Islamic elements in the Egyptian political leadership (which is also shared by the leftist organizations). In its eyes, Israel is the foremost enemy of Egypt and the Arab and Islamic world, and the peace agreement with it (the Camp David agreement) is considered a dead letter. The new Egyptian tone indicates the beginning of the formation of an Egyptian policy of confrontation against Israel, first of all in the political and economic spheres and through direct support of the Palestinian armed struggle. Egypt is setting itself on a collision course with Israel, using the Palestinian issue in all its aspects – including Israeli military operations against Palestinian terrorism as well as Israeli policy in Jerusalem or the West Bank – as an excuse for direct Egyptian intervention. At the operational level, the new Egyptian leadership declares its commitment “to assist the Palestinian struggle/resistance in all its forms and manifestations,” which means providing direct assistance to Palestinian terrorism, which may be expressed through money, weapons, training, and transfer of intelligence. Defining Israel as a “major enemy” which threatens national Egyptian and Arab security is of great importance, since its translation into action means building a military capability to deal with the “Israeli threat,” including an attempt to deny Israel any advantage in the nuclear field and/or the development of Egyptian nuclear weapons. At present, the new Egyptian political leadership cannot translate these policies into actions. The Muslim Brotherhood and Salafi party attained an absolute majority in the Parliament and the Upper House, but the full transfer of powers from the military government to the elected civilian government has not yet been completed. 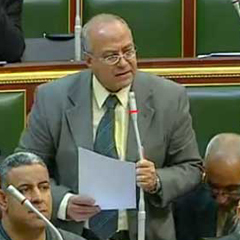 Today, Egyptian foreign policy is not directed by the Egyptian Parliament. For now, Egypt is still controlled by the military and the government leaders appointed by it. This situation is likely to change after the presidential elections on May 23-24 and the establishment of a new civilian government. The division of responsibility between the new government and the military in the future remains to be seen. But the Muslim Brotherhood’s victory in the presidential election could potentially complete its takeover of the political system in Egypt and allow the Islamic movement to accelerate its political consolidation, to purge the army of its old guard, and to recapture a leadership position in the Arab world, based in part on the struggle against Israel. The Egyptian position, which is completely supportive of Hamas and the struggle against Israel, in practice, eliminates the ability of the Palestinian leadership in the West Bank, headed by Mahmoud Abbas, to lead political moves toward an historic compromise agreement with Israel. Moreover, it gradually prepares the ground for permanent political friction with Israel which, if not addressed, could even develop into military clashes (against an Israeli action in Gaza or along the border between Israel and Egypt).